Pool table lighting is one of the most important components of your game room. Your lighting may include pool table lights, game table lights, lights for over your bar, or in some cases, lighting for peripheral areas of your room. The lighting in your gameroom needs to be precisely located so you light what you want and don't interfere with the pool players and or game players line of sight. Nothing is worse than having a bright light from another area interfering with your game. So plan ahead and create properly lit areas of your gameroom. The table lights and matching pendant lamps we carry are all of top quality made with metal or glass and sometimes leather or real wood with stain that matches our pool tables. We aim to provide you with the largest selection and best value regardless of your lighting choice. This article will give you some helpful tips in picking out and placing the right lighting. The vast array of choices of pool table lights today will match any home or circumstance. You could go with classic styling like these classic stained glass pool lights from RAM Gameroom, available in classic long version and a 3-lamp version. Perhaps you'd prefer a more contemporary fixture such as the Odessa, or the Empire Fractional Rod Light, both from RAM Gameroom. 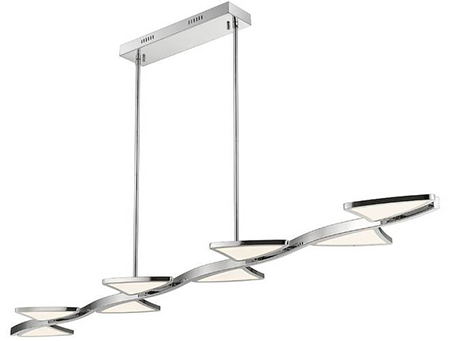 Or you could go really futuristic with the Aeon from Z-Lite. 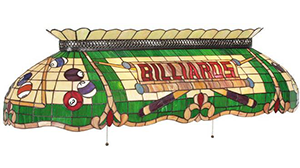 A properly sized pool table light (between 40 and 60 inches long, depending on the size of your table) will illuminate the entire playing surface of the table. You don’t want a light only in the center with dimly lit rails. The table lighting should eliminate all shadows on the table, including under the rails. Also pay attention to other lighting in the room. It's important to make sure there are not other light sources or reflections that could affect a players view while shooting. The main goal is to adequately light the entire surface of your table including the top of the rails and also allow enough room to shoot and maneuver under the light. The distance from the bottom of the lampshade to the top of the table should be 36 to 42 inches above the playing surface. The length and width of your fixture and pool table will need to be taken into consideration. It helps to have a second person give you feedback on the effectiveness of the light while you raise and lower the light. Pro Tip: It’s easier to install the pool table lights before the pool table is put in. We can give you the height the top of the pool table will be so you can put it at the proper height. Most players agree that a fluorescent bulb, whether a tube style or energy-efficient bulb, provides the most even lighting across the playing surface. Some pool table lights direct all the light to the table and some allow light to escape above the lamp or through certain transparent materials in the lamp. If you have a very dark space consider a pool table light that provides the extra light. Bar lighting can be done with a pendant lamp or, if the bar is large enough, a pool table light works very well. For over-bar lighting, usually you will want a weaker and softer bulb than what is needed over a pool table. Consider using a rheostat switch so you can adjust the amount of light. 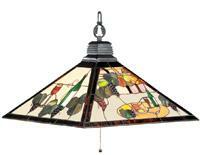 Pendant lights are very versatile and can light up a gaming table or just hang over your favorite chair. Many of our pendant lights are an exact match to the pool table lights so you can have a common theme in your gameroom.